Until 7 pm, you can drop in at American Legion Post 160 in The Triangle (3618 SW Alaska) to ask questions and get info about SDOT‘s soon-to-start Avalon/35th/Alaska project. The 35th section will have to be rebuilt, with a new water main, because of damage done in a break. On Avalon, Ducksworth says, the Genesee to Yancy stretch is likely to be the first site, and the crew might move northward during summer, which Luna Park Café owner John Bennett says would be the worst possible time of year for his business – the summer peak. He is among those we’ve seen and heard here and the doors are open to all until 7. P.S. If you have questions but can’t get here – the project mailbox is avalonpaving@seattle.gov. Below with Post 160 commander Keith Hughes, left, and American Legion state chaplain Chris Kuhnert is Chelsea Clayton, a West Seattleite who works as veterans’ affairs director for U.S. Senator Patty Murray. The heart of the message: “Please accept our sincere thanks for your dedication and service.” Tomorrow, November 11th, is not only Veterans Day but the 100th anniversary of Armistice Day. P.S. Post 160’s observance continues tomorrow morning as volunteers will be out early to place flags in The Junction. We don’t know how the 34-year-old victim is doing – her dog was not hurt in the Tuesday night incident, Tate said – but online records show that the 26-year-old driver arrested for suspected DUI and hit-run spent a day and a half in jail before posting bond and being released on Thursday. Meantime – when SFD answered our original inquiry last week, they described Tate as a “new firefighter” just out of probation; that means, we learned today, he’s been a firefighter for a year. Currently he’s assigned to Engine 32, which is based at Station 32 along with three other vehicles and their crews – Ladder 11, Medic 32, and Battalion 7. He explains he wanted to be a firefighter ever since he was a kid, impressed by firefighters who responded to a kitchen fire at his grandma’s house, saying he never forgot how “helpful” they were. The West Seattle YMCA (3622 SW Snoqualmie; WSB sponsor) is closed today through September 9th. The Y website explains that this is “Facility Improvement Week,” with reopening scheduled for Monday, September 10th. ADDED 1:12 PM: We asked West Seattle/Fauntleroy Y executive director Shalimar Gonzales for a few more details about the closure: “‪During this time we perform normal maintenance including deep cleaning, resurfacing and repainting the basketball court, regrouting the pool, and more!” This is just the branch in The Triangle – the Fauntleroy location remains open, regular hours. 2:56 PM: As previewed here, the West Seattle VFW invites you to visit as its 100th-anniversary open house continues until 4 pm. Historic items and photos are on display; they’re also hosting the state commander, U.S. Air Force veteran Linda Fairbank. And veterans are invited to join, first year free, per West Seattle commander Steve Strand (a U.S. Army veteran). More photos to add later; the hall’s at 3601 SW Alaska in The Triangle. The state commander presented the post with a Century Award certificate from the national commander; the exact 100th anniversary is tomorrow. Got questions about the newest Avalon Way plan? | Comments Off on Got questions about the newest Avalon Way plan? 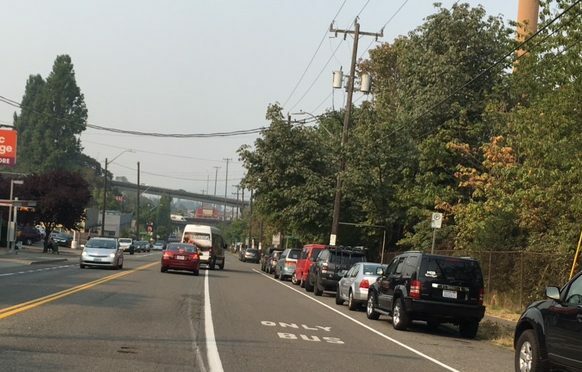 As we’ve been reporting, the SW Avalon Way rechannelization/repaving plan is now at 60 percent design, and that’s where SDOT hopes to get remaining issues/concerns surfaced before the final phase of design and the start of construction next spring. So if you have questions/comments, you can take them directly to SDOT staff at the open house that’s on until 7:30 pm at American Legion Post 160 in The Triangle (3618 SW Alaska). You can also preview the project maps/graphics on the SDOT website (we added them today to our preview story from last night). If you can’t make it to the open house, you can send comments to the project team via avalonpaving@seattle.gov. As first reported here last weekend, SDOT has reached another design milestone in the SW Avalon Way repaving/rechannelization plan: “60 percent” design. And that’s why they’re inviting you to an open house tomorrow (Thursday, August 23) for a closer look and comments. BICYCLE RAMP: At the north end of the project zone, Anderson says, they heard a lot of comments against moving bicycles onto the sidewalk/trail north of the relocated non-Rapid Ride bus stop. So the ramp onto the sidewalk/trail will now be south of the bus stop. STREET PARKING: They’re evaluating where street parking can be limited to 2 hours to encourage turnover, especially for Luna Park businesses. One place that looks possible: SW Bradford. Anderson says they’re asking for feedback on the rest of the corridor too (keep in mind that the project zone is not only the entirety of Avalon between Spokane and Fauntleroy, but also 35th between Avalon and Alaska, plus one block of Alaska between 35th and 36th). The street-parking evaluation also includes load zones, and SDOT wants to hear from you where those would work best. They’re proposing “adding back one parking space on the west side by Luna Park Café” as a loading zone, but are looking for more extensive feedback given that the rechannelization of Avalon will take out the center turn lane, which has been a de-facto load zone in some spots. “Since that’s going away, we have to figure out how trucks can load,” Anderson said. One parking issue they won’t resolve in time for the meeting – they were asked for “better numbers” in terms of a more precise count of current and proposed street parking, since SDOT’s measuring standards (as little as 16′, as much as 31′) don’t necessarily match what you might consider a parking space. This assessment won’t be ready until next month. LEFT-TURN POCKETS: The one on NB 35th to WB Alaska will be extended, by community request. Turn pockets, however, will NOT be added at Avalon/Yancy – wouldn’t work with transit and bicycle lanes, said Anderson. TIMELINE: Because of the extent of the work – including water-main replacement and complete rebuilding of the road on the 35th SW section – this “could be two seasons worth of paving,” Anderson said, so they want to hear from community members regarding “different phasing options.” It’s still planned to start next spring, but the phasing discussion would also tackle where they would start. Again, tomorrow’s open house is 5:30-7:30 pm at American Legion Post 160 (3618 SW Alaska) – drop in when you can. And watch the project page, where updated maps/graphics for the 60 percent design should be posted soon. ADDED 10:07 AM THURSDAY: We’ve just received from SDOT the boards and major map, added above. West Seattle VFW celebrating its centennial, and you’re invited! The West Seattle VFW would like to invite everybody to help us celebrate our 100-year anniversary this Sunday, August 26th, 2018, at 2:00 PM. Our Post was created when the original Seattle Post #24 COL Theodore Roosevelt joined with the Sgt Farwell post to create Post 2713 Farwell-Roosevelt. We are still housed in the old Morrison Hall at 3601 SW Alaska Street, where we have been since the 1960s. We are across the street from the American Legion who have the cannon out front. We have been researching our history and will have old newspaper articles and photographs on display. We also have compiled a database of members from 1918 and will attempt to have a list if anybody wants to check it for family members. Our database is incomplete, but the original applications include veterans from the Spanish-American War. The Veterans of Foreign Wars of the US strives to give back to the community while allowing our members a friendly face and open place to gather and share their experiences. We are offering a one-year free membership to any qualifying veteran that lives or works in West Seattle. If you have a veteran in your life, please bring them by. Many of our members were encouraged to join by children, grandchildren, or others, only to find out the benefit it added to their life. We are all-inclusive – all ages, genders, races, religions, orientations. This is a free event and our doors will be wide open. Anybody is welcome to come in and browse our building, check-out the displays, or talk with our veterans. We hope to see you there. Will ‘near-term improvements’ be made while Fauntleroy Boulevard project’s fate awaits light-rail decision? “Frustrating” was the word City Councilmember Lisa Herbold used tonight to describe an SDOT-led meeting in which she participated last night. Last night’s meeting was a “roundtable” during which SDOT unveiled proposed “near-term improvements” in the area of the on-hold Fauntleroy Boulevard project, to be funded by a fraction of the Move Seattle levy money earmarked for the full project. Herbold’s comment was made at tonight’s West Seattle Transportation Coalition meeting (separate story on that later). Since that decision is still more than half a year away, roundtable invitees “were not being asked to make any choices,” facilitator Susan Hayman clarified at the start of the discussion. Big turnout for a special storytime tonight at the West Seattle YMCA (WSB sponsor) – in honor of Pride Month, Mama T was the guest for Drag Queen Story Hour. P.S. The Pride Month toiletry-donation drive for LGBTQ+ youth continues at the Y (3622 SW Snoqualmie) through Saturday. For more than 165 years, the Y has played a central role in knitting together the vibrant fabric of America. We believe the Y must continue to lead the way to a brighter future by following our belief that we are stronger when our doors are open to all. We want to ensure all people- across all dimension of diversity- feel welcome and valued as part of the Y family. At the Y, we use the month of June to celebrate and highlight our LGBTQ+ community, members, and staff. We honor those who have done the hard work for equity and have dedicated the Y to be among them. We remember the brutality and inhumanity that has been and is perpetrated against our LGBTQ+ family. And most of all we honor all those who are living life as their authentic selves and those who are on the path to that discovery. · Through June 30: Toiletry Drive for LGBTQ+ Youth. This month we are supporting Lambert House, an LGBTQ drop-in youth center on Capitol Hill. 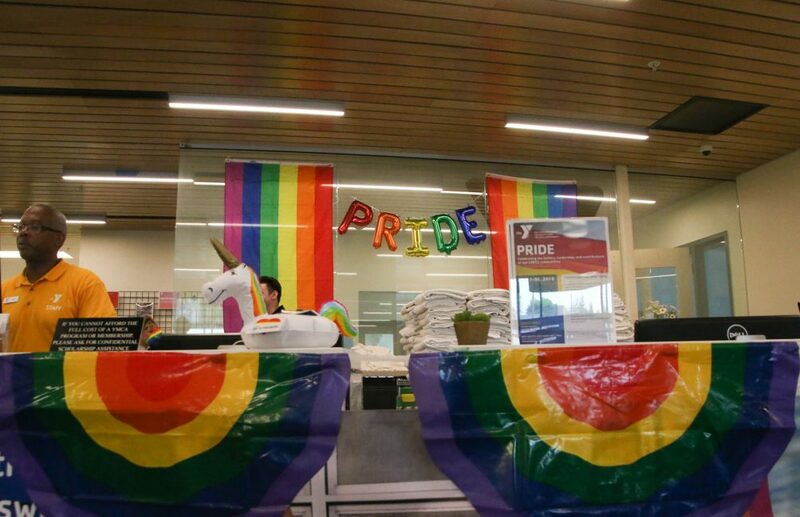 They have requested sock and travel size personal care products to support LGBTQ youth throughout Seattle that access their services. · June 28, 6:30-7:30 pm: Drag Queen Story Hour: Join special guest, Mama T, for a fun-filled hour of stories, photos, and fun! Sharing stories that celebrate inclusion, acceptance, and diversity, Mama T will provide a fun and lighthearted story time at the West Seattle YMCA for kids and their families. Feel free to bring your pillows, blankets, or favorite stuffed animal! Light refreshments will be available. Hold your spot by (going here). 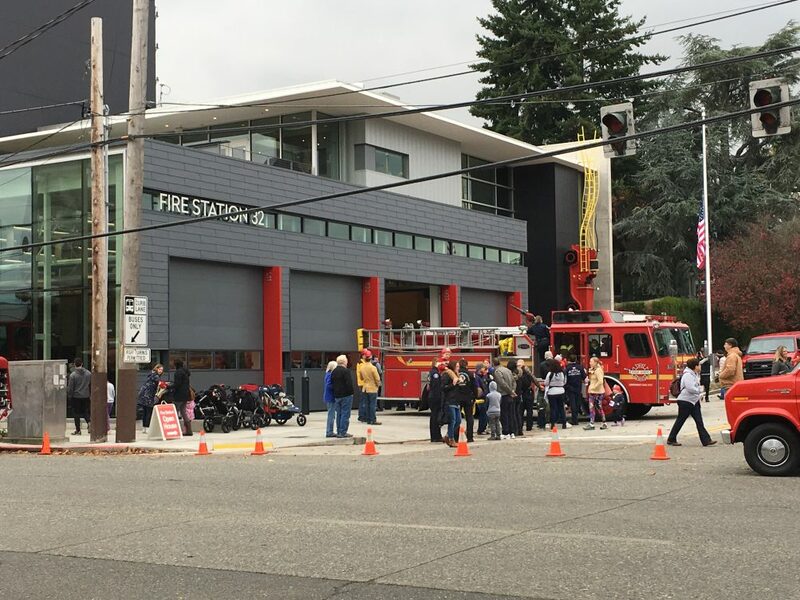 The Y’s main West Seattle location is in The Triangle at 36th/Snoqualmie; in Fauntleroy, it’s at 9140 California SW.
Station 32, the city says, is one of only two Platinum LEED-certified fire stations in Seattle, one of three in the state. The Bohlin Cywinski Jackson-designed station opened last August, on the same site in The Triangle (38th/Alaska) as the former Station 32. Just so you know what that short-lived Seattle Fire “full response” at 37th/Alaska was about – turned out to be a dryer fire in the Link Apartments building, per SFD, and most of the crews have been canceled. Inside and out, it’s a big day at the West Seattle YMCA (36th/Snoqualmie; WSB sponsor) – free fun for Healthy Kids Day, until 1 pm! Demonstrations too – see the updated list on the Y’s Instagram feed! Today’s fun is all free. SATURDAY: Healthy Kids Day 2018 at West Seattle YMCA! The Y is at 36th SW/SW Snoqualmie (map) in the West Seattle Triangle. And if you decide to become a member during HKD – no joining fee.